Out of all of the tools and appliances that we use in our modern shops, none brings out the hoarder in all of us quite like the humble clamp. Our shops may be littered with dozens upon dozens of clamps, yet there still never seems to be enough of them. So we eagerly foam at the mouth each time a supplier has a sale on clamps, and then plunk down another couple of hundred dollars to feed our addiction. At one time, quite a number of years ago, as I was staring at a 7 foot long wall full of clamps in my 90 square foot workshop, I asked myself if they were all really necessary (I really needed that wall space for other tools and appliances). The question really made me think. What was done historically? Did our ancestors hoard clamps the way we do toady? If they did, why don’t they turn up in greater numbers on the second hand market? So in an effort to discover the clamping methods of our ancestors, I began researching period inventories, engravings, and images to see if I could decipher their secrets. In addition, in order to be able to draw real world conclusions about period methods, I rid my shop of every modern clamp. I sold every pipe clamp I owned, and I relegated my few remaining modern “f” style and parallel jaw clamps to the garage where I would be less tempted to reach for them during a stressful assembly. I forced myself to work without the convenience of modern clamps to fully explore period methods for myself. The experiment taught me some very valuable lessons. There is historical evidence that clamps made of iron and wood have been used since at least the 17th century. Several period texts and paintings speak of or picture some kind of clamp. From what I have been able to decipher, however, it is unlikely that clamps were as heavily relied upon for assembly as they are in today’s modern shops. 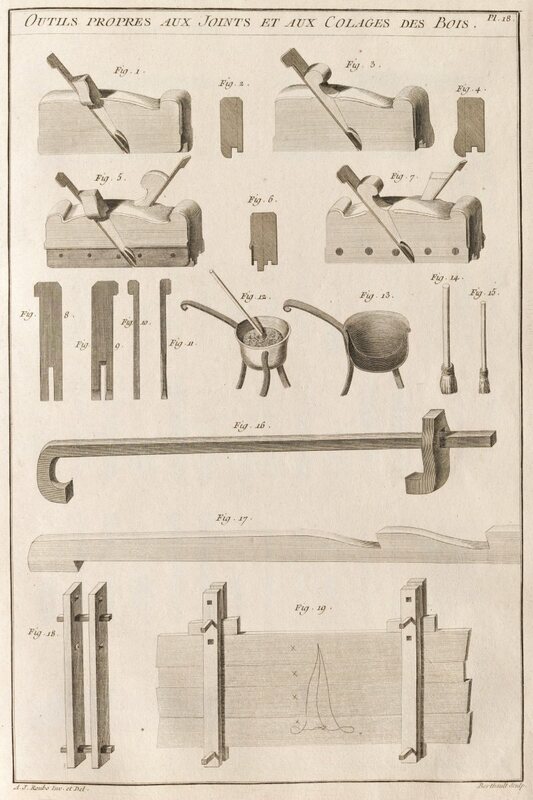 The “new”, portable twin screw wooden vise (often referred to as a “Moxon” vise today) is really not such a new idea. Here it is pictured at the top right in an engraving from a book written in 1676 (before “Moxon” was printed). 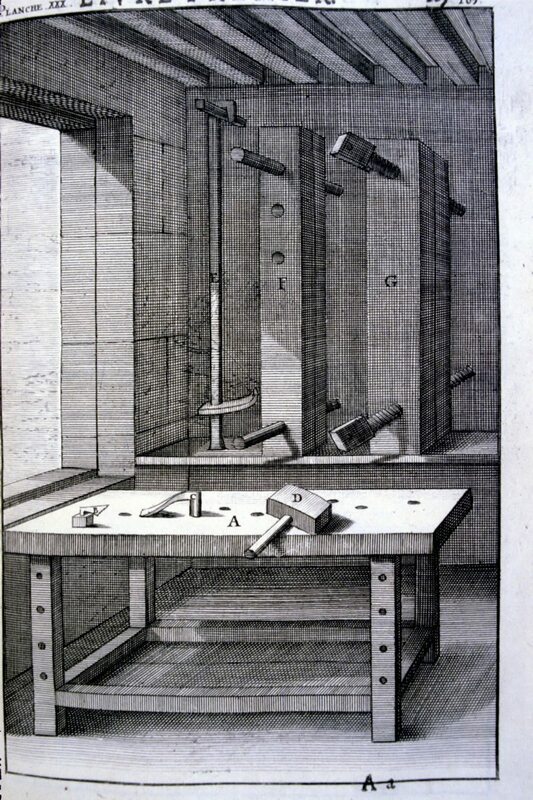 This vise was the predecessor to the modern hand screw clamp. One of the more useful jobs of period clamps was holding stock while it was being worked. Today, we use vises permanently attached to a workbench. However, early vises were separate appliances that could be hung on a wall out of the way when not needed, or fixed to the workbench with a holdfast or two when they were. These early wooden twin screw vises are the predecessor to the hand screw clamp that we know today. Hand screw clamps are similar to portable twin screw bench vises. They can be held to the bench top with a holdfast, or clamped within the jaws of another vise to hold work at odd angles. The primary difference between the portable twin screw vise and the wooden hand screw clamp is the orientation of the screws. In the portable twin screw vise, both screws pull the front jaw toward the rear jaw. In the wooden hand screw clamp, the front screw pulls and the rear screw pushes. Modern metal hand screws, on the other hand, use complicated screws with threads that reverse direction half way down the shaft, and special left and right hand threaded nuts. Like the portable bench vise, hand screw clamps are fantastic work holding devices. Their design makes them capable of exerting enormous pressure. The jaws may be angled to each other slightly so they do a good job of holding tapered stock too. By sawing a notch in the jaws, they can be used to hold round work, or hold square work on edge. 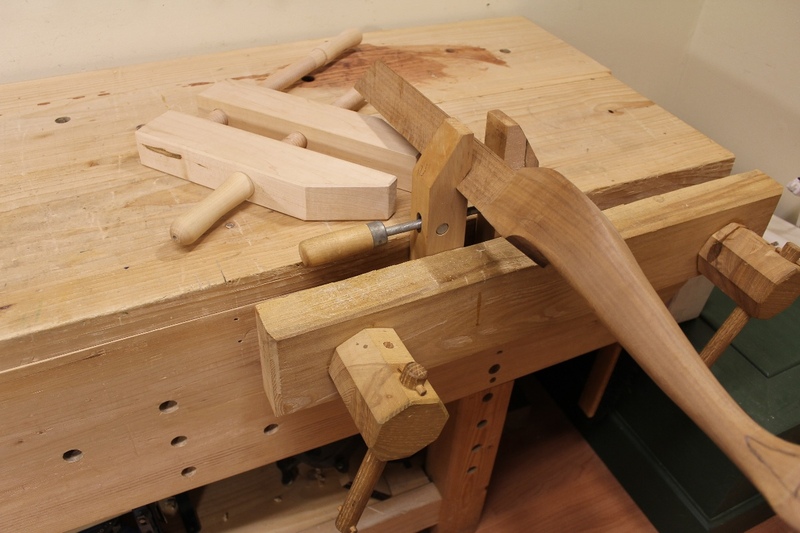 They can also be secured in a bench vise for holding awkward parts for shaping or carving. Plus, you can make an entire shop full of hand screws in all different sizes with an inexpensive wood threading kit and scraps from around the shop. The wedge shape of these iron staples pulls the adjacent boards tightly together. 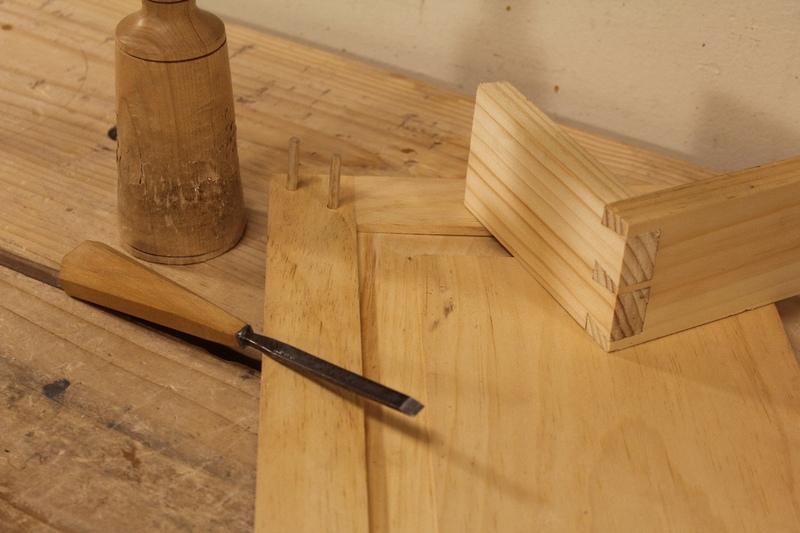 Another common use for clamps in a period shop was for securing the boards of a wide panel while the glue dried. Small, two board panels and edge joints are easily joined with no clamps using hide glue and a rub joint. However, longer panels, and those glued up from more than two boards, benefit from a couple of clamps to hold things in place. The purpose of the clamps, however, is simply to hold the boards in place, not to close an ill fitting joint. 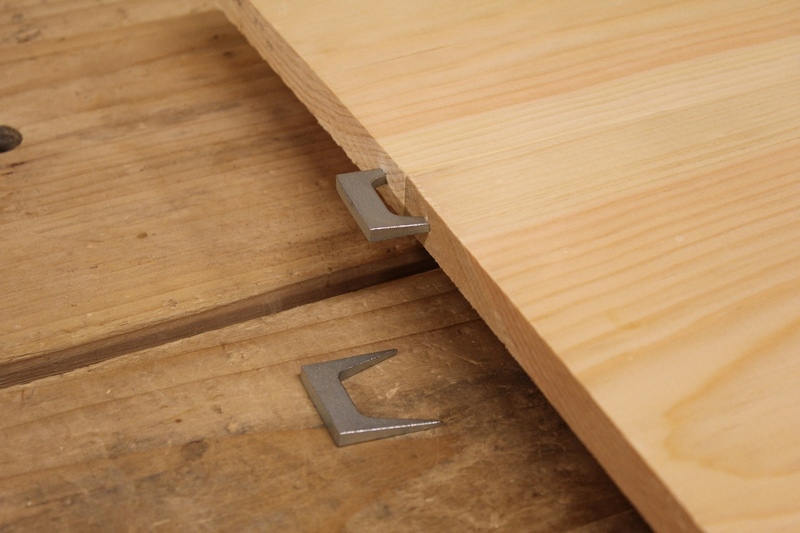 If your joints have gaps when you dry fit them, clamps won’t solve your problems. The joinery must fit well. The simplest of the clamps used for holding the adjacent boards in a panel was the iron staple or pinch dog. 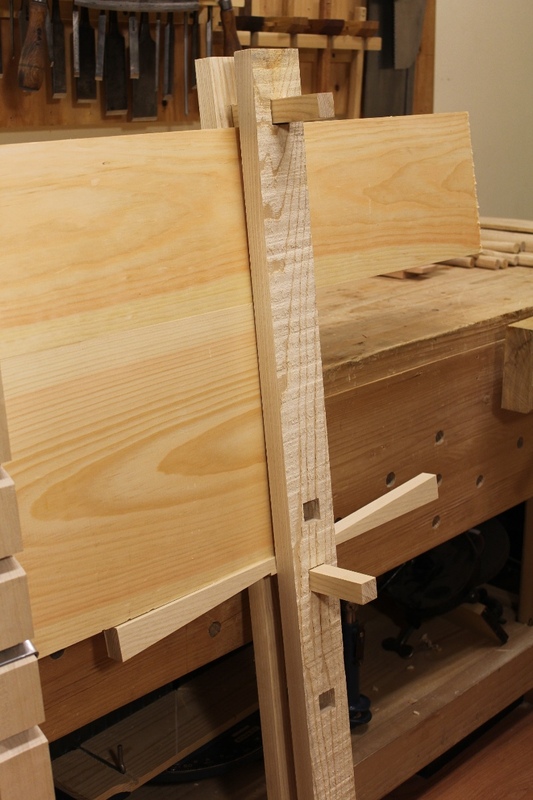 These clamps are simply driven into the end grain of adjacent boards. The wedge shape of the pointed legs serves to pull the two adjacent boards tightly together as the spikes are driven in. Pinch dogs are best used on shorter panels or in conjunction with a different kind of clamp at the middle of the panel, because the pinch dogs only serve to hold the ends of the boards and do little at the center of a long panel. The mechanics of these iron bar clamps are similar to those of a holdfast. Just a tap with a hammer locks them up firmly. Another tap releases them. These don’t necessarily provide you with an inexpensive alternative (they’re not inexpensive) – they’re just cool. There was also another type of iron clamp in use (“E” in the engraving above and Fig. 16 in the engraving below). You could say that these iron clamps were the predecessors of the modern “f” style clamp. But instead of using a spring loaded lever to lock the lower arm in place, they work like a holdfast, only without the workbench. They are secured with a blow from a mallet and hold tight as a result of the flex and offset of the iron bar in the slightly oversized hole of the movable jaw. The pair pictured here are blacksmith made reproductions, and they do work surprisingly well. They’re particularly good for tasks like holding a frame together while transferring the drawbore locations to the tenons. The wedge style panel clamps pictured at the bottom of this engraving are such a simple design, who needs expensive commercial clamps. Simple wooden panel clamps were also quite common (see Figs. 18 & 19 above and Fig. F in the top engraving). They’re nothing more than two boards connected by a couple of pins. The pins can be moved to any number of holes depending upon the width of the panel. Pressure is applied by driving a wedge between one of the pins and the edge of the panel. A couple of boards, a couple of pins, and a wedge. What could be simpler, or less expensive? I’ve been using my version of these panel clamps for several years now. They work so well, I have no desire to go back to pipe clamps. The only design element that I will change on the next ones will be to make one face of one of the pegs angled to match the angle of the wedge. This way, only one wedge will be required to tighten the clamp (similar to the one in the engraving) rather than two opposing wedges. This clamp would be right at home next to the modern pipe and parallel jaw clamps that adorn the walls of most shops today. The last clamp that I’ve seen examples of is a bit more complex in design. I noticed this one in a painting of an English joiner’s shop from the early 1800s. The shops at Colonial Williamsburg have a few reproductions of this style of clamp, as does the museum shop where I used to volunteer. There’s a heavy wooden bar, with notches along its back side. A movable jaw is positioned by an iron loop that seats into the notches. At the fixed end is a wooden screw that applies pressure to the edge of the panel. The design is very similar to modern pipe and bar clamps. I’ve tried all of these period style clamps, and they work every bit as well as modern commercially available clamps. They don’t have any significant functional advantages over modern clamps. But most of them (with the exception of the blacksmith made iron bar clamps) are significantly less expensive. In fact, all of the wooden ones can be made in a couple of hours of enjoyable shop time from hardwood scraps left over from other projects, allowing you to expand your clamp collection for very little money. The real lesson that I learned by dumping all of my modern clamps and working with just a few period versions for the few years that I did is that I really don’t need clamps in as many situations as I once thought. Modern joinery methods, such as biscuits/dominoes, dowels, and cope and stick joinery rely only on the glue to hold things together. 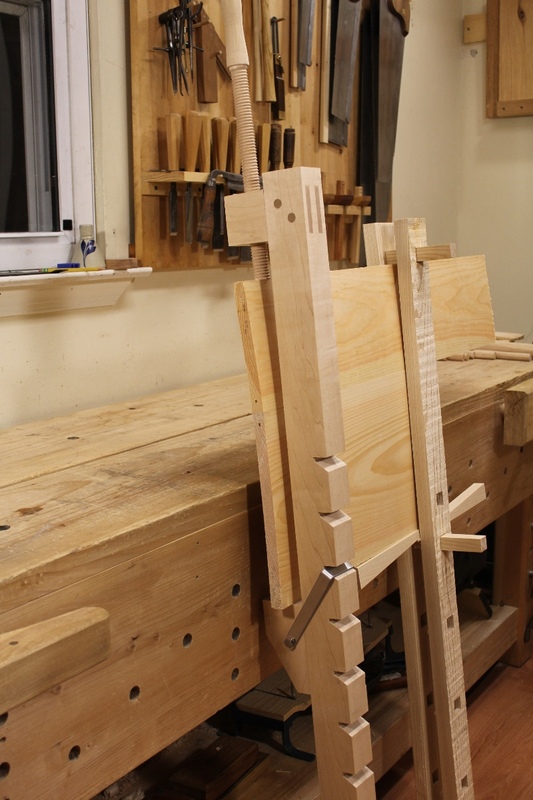 As a result, clamps are required during assembly to keep everything together until the glue dries. I assembled these two sample joints without glue several years ago. They’re still just as tight as the day they were cut. On the other hand, traditional joinery, like dovetails and drawbored and/or wedged mortise and tenon, make the use of clamps unnecessary for assembly tasks. Well fit traditional joinery can actually be assembled without glue (and they frequently were in 17th century joined work) and the joints will stay tight indefinitely. The mechanical connection of these joints is their primary strength. Glue is a secondary measure. By using traditional joinery, much of my need for clamps is eliminated. When I assemble a dovetailed joint, like a case or drawer, I put glue on the joint, fit it together, and set it aside to dry. There’s no need to clamp the joint as long as it fits well. It will stay together just where it is. The same holds true for mortise and tenon joints. I will add glue, assemble the joint, and then drive the drawbore pegs in. The pegs draw and hold the joint tight without the need for clamps. These days, about the only thing I need clamps for is to hold odd shaped bits of wood while I perform some kind of work on them, and to keep the adjacent boards of a wide panel aligned while the glue dries. So in most cases, I have little need for a shop full of clamps – though it seems that still doesn’t prevent me from acquiring them. Old habits die hard. Posted in Random Thoughts, Tools and tagged clamps, hand screw, panel clamp, pinch dogs. Great article, Bob. These old style clamps always intrigue me—the wedged panel clamps, especially. Thanks so much for sharing! Great article, thanks. I’ve been wondering why round pegs wouldn’t work in the Fig 18/19 clamps, but they surely thought of that 400 years ago. Don Williams posted about these recently, too: http://donsbarn.com/roubos-panel-clamps/ . Round will work. See the top engraving. Those pegs are round. But the contact area between the wedge and peg is much less. Plus, in time, the round peg will dent the top of the wedge and the wedges can work loose in those areas. Probably not a significant issue. Thanks for the article. Really great info! Any recommendations on the wood threading kit (sizes, brands, etc.)? I use the one commonly sold by most woodworking retail chains. I don’t think it actually has a brand. I think each store just rebrands the same one. I find the 1” size the most useful. That was a awesome . Thank you! Really will make does! Thank you Bob, I really enjoyed your article, I still use the wooden screw clamps. That is after I learned how to use them from Bob at CT Woodworking. I really liked some of the other clamps you showed. I would like to know your suggested wood for building them. Screw one I would think beech is fine but what about the wood panel ones with the wedge? Anything that’s not a softwood will work. In fact, for the wedge clamp without the wooden screw, you can even use construction grade 2x material. A hardwood is really only required for the wooden screws. 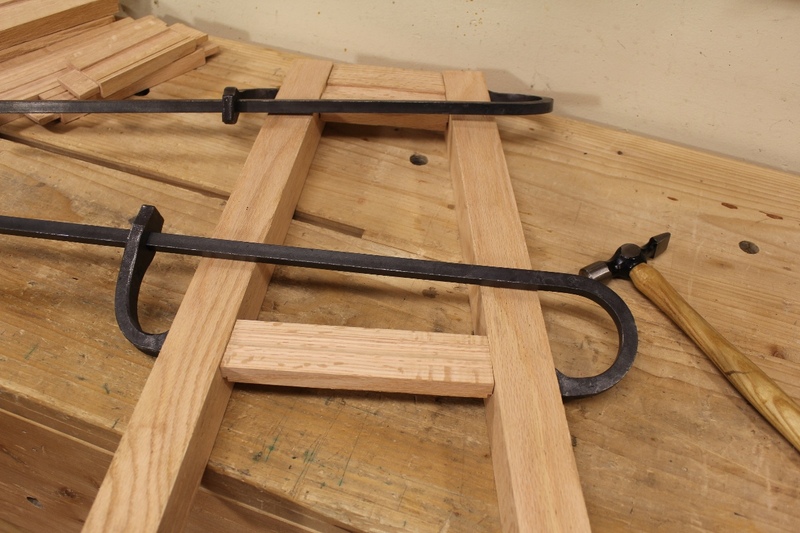 The two styles of panel clamps almost look similar enough that someone could design a single “bar” that could have either style clamping bits attached. Or maybe there would be no reason to have both style panel clamps. Need still struggling to find a good tap & die screw set… From Chris, the German one would be the way… Help would be appreciated. While Chris is likely correct, I have the Taiwanese manufactured version from Woodcraft. It has worked fine for me. Can you make a video on how to use them and how they work ? wow! you’r fast;) Back to the Future!